Growlers, Grapes and Grains is a fresh take on the tasting experience, craft beers, wine and hard cider all in one place with excellent food to compliment your samplings. 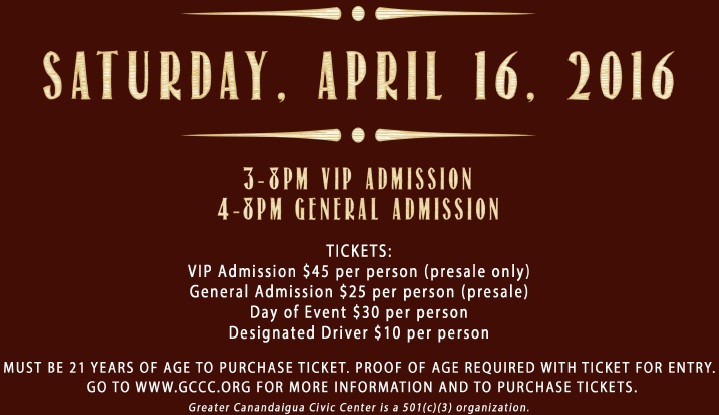 The country rock band Eddie Lee and Closing Time along with acoustic artist Dave McGrath will set the atmosphere for a casual afternoon to be shared with friends… all to benefit the Greater Canandaigua Civic Center. Please come and attend this fun event. If you can't attend we have many sponsorship levels that will help us achieve our fundraising goals. Please see Sponsorship menu tab for opportunities to support your local Civic Center. Your support is extremely important to us.